Indian agriculture has a lot of dependency on farm labour for many kinds of operation. The main products of the farm are needed to be harvested. Nowadays the cutting of weeds, grass, trees, tree branches, paddy is done by snips. Thus taking into account the fact that all this activity is done in the open field we thought of that solar energy plays a vital role in drying agriculture products and for irrigation purpose and it is done by pumping the well water in remote villages without electricity. Thus, this Technology on solar energy can be extended for cutting paddy, weeds, and lawn grass etc., by using a solar-powered motor. In present days the Concept and Technology employing this Non-conventional energy becomes very popular for all types of development activities. Finding solutions, to meet the “demand of Energy” is the great challenge for Social Scientist, Entrepreneurs, Engineers and Industrialist of our Country. According to them, the use of Non-conventional energy is the only alternate solution for conventional energy demand. There are many applications in Agriculture Sectors. Multipurpose agriculture cutter which can be used for finishing work as well as for cutting long, thick grass, brush. Its have been carefully designed for user comfort by considering ergonomics aesthetics. Particular attention has been given to avoid pollution and worker tiredness. This project deals with the use of solar energy in the replacement of energy from any fossil fuel where abundant sunlight is available to tap solar energy and the project concept to develop a portable, lightweight multi-purpose agriculture cutter and shear to carry the above-mentioned activity using solar powered 12 Volt DC motor. Agriculture is an important part of the Indian economy and culture, and it can play an important role in the distributed generation of energy. This project concept identifies the opportunities for solar energy use in agriculture. Farmers have the tradition of being stewards of the land, and their investment in renewable energy supports their role of protecting the land, air, and water. Solar energy, like other renewable, offers an opportunity to stabilize energy costs, decrease pollution and greenhouse gases (GHGs), and delay the need for electric grid infrastructure improvements. Solar energy systems have low maintenance costs, and the fuel is free once the higher initial cost of the system is recovered through subsidies. In agricultural fields or in the nursery or even in household growing grass, the grass is commonly found the problem. Removal of the grass is also a tedious job involving a lot of human efforts. In the modern world as a time for carrying out many things has reduced drastically so as to be done the removal of grass involving the use of a machine. This machine can be railed as multipurpose agriculture cutter which mostly depends on the type of blades that we use to cut the grass. It is simple in construction where a very high-speed motor Is connected to an end of a holding rod that hangs with a shoulder and held with hand to the free end of this rod a battery pack is attached. Also, a solar panel can be attached to charge the battery thereby making the multipurpose agriculture cutter run with the help of solar energy. The cutter used is actually a flexible blade that cuts the grass with high-speed rotation. The high-speed rotation of the blades along with the centrifugal force acting on it due to its minimal weight enable the flexible blades to cut the grass easily despite being not any hard and Sharp material which is generally associated with any cutting blades. 1. Kharif: Kharif crops or monsoon crops are domesticated plants cultivated and harvested during the rainy (monsoon) season in South Asia, which lasts between April and October depending on the area. Main Kharif crops are millet and rice. Kharif crops are usually sown with the beginning of the first rains in July, during the south-west monsoon season starts on 16 April and lasts until 15 October. In India, the Kharif season varies by crop and state, with Kharif starting at the earliest in May and ending at the latest in January, but is popularly considered to start in June and to end in October. Kharif stand in contrast with the rabi crops, cultivated during the dry season. Both words came with the arrival of Mughals in the Indian subcontinent and are widely used ever since. Kharif means “autumn” in Arabic. Since this period coincides with the beginning of autumn/winter in the Indian sub-continent, it is called “Kharif period”.Kharif crops are usually sown with the beginning of the first rains towards the end of May in the southern state of Kerala during the advent of the south-west monsoon season. As the monsoon rains advance towards north India, the sowing dates vary accordingly and reach in July in north Indian states. These crops are dependent on the quantity of rainwater as well as its timing. Too much, too little or at the wrong time may waste the whole year’s efforts. 2. Rabi: It is an agricultural crop sown in winter and harvested in the spring in South Asia. The term is derived from the Arabic word for “spring”, which is used in the Indian subcontinent, where it is the spring harvest also known as the “winter crop”. The rabi crops are sown around mid-November after the monsoon rains are over, and harvesting begins in April/May. Their main source of water is rainwater that has percolated into the ground; they require irrigation. Good rain in winter spoils the rabi crops but is good for Kharif crops. The major rabi crop in India is wheat, followed by barley, mustard, sesame and peas. Peas are harvested early, as they are ready early: Indian markets are flooded with green peas from January to March, peaking in February. The rabi season starts with the onset of the north-east monsoon in October. Many crops are cultivated in both Kharif and Rabi seasons. The agriculture crops produced in India are seasonal in nature and highly dependent on these two monsoons. 3. Zaid: In the Indian sub-continent, the crops grown on irrigated lands which do not have to wait for monsoons, in the short duration between Rabi and Kharif crop season, mainly from March to June, are called Zaid crops (also written as Zayad crops). These crops are grown mainly in the summer season during a period called the “Zayad crop season.” They require warm dry weather for major growth period and longer day length for flowering. The main products are seasonal fruits and vegetables. Photo-synthesis by biological plants, production of oxygen and organic materials, production of organic chemicals and biomass. Wind due to unequal heating of water, land surfaces. Friction is greatly reduced Frictions between the parts are high. “Chiu-Fan Hsieh” in his paper titled “The effect on dynamics of using a new transmission design for eccentric speed reducers” has stated new transmission design for eccentric speed reducers that differs from that used with a traditional cycloid speed reducer. This paper proposes a new transmission design for eccentric speed reducers that differs from that used with a traditional cycloid speed reducer, but we thought of making in a simple manner as its maintenance cost is high . “R.Joshua, V.Vasu and P.Vincent” in his paper titled “Solar Sprayer An Agriculture Implement” has stated that Energy -demand is one the major thread for our country and finding solutions, to meet the “Energy -demand” is the great challenge. With his paper, we inspired to serve the agricultural department and started to think about to make a project useful for them with less investment. .
“Ketchpel, ‘Jr. et al” in his paper has stated that A shear for grass and the like includes a tooth plate on which is pivotally mounted a plurality of shearing members, each including a narrow and resiliently deformable blade element. As we are making a multipurpose cutter we just had a glance about the cutters in his paper. .
“Hemant Ingale, N.N.Kasat” in his paper titled “Automated Solar Based Agriculture Pumping” he stated that Solar power is absolutely perfect for use with irrigation systems for gardens, allotments, greenhouses, and polygonal. When the sun is shining you need more water and so the solar power is there for the pump. By adding a suitable deep-cycle leisure/marine battery, power can be made available 24 hours per day enabling watering in the evening -the best time to water plants in the summer so that the water has a chance to soak into the ground in his paper we gathered information about the capacity of battery, motor, solar panel which is to be used..
Abhilash Gurjar et.al, the paper titled Solar Powered Sprayer. In this, he implemented “Energy Alternate Device” To Convert the “Fuel Operating System” as “Free Energy Operating System” for agriculture implementation. The conventional sprayer having difficulties such as it needs a lot of effort to push the liver up and down in order to create the pressure to spray. Another difficulty of petrol sprayer is to need to purchase the fuel which increases the running cost of the sprayer.This can be operated using solar energy during the presence of the sun, otherwise, it can be operated using the electricity supply. The main advantages of the presented system are the running cost reduces to a minimum and also time-saving..
Siddaling et al, The project titled “Design and Fabrication of Small Scale Sugarcane Harvesting Machine”. 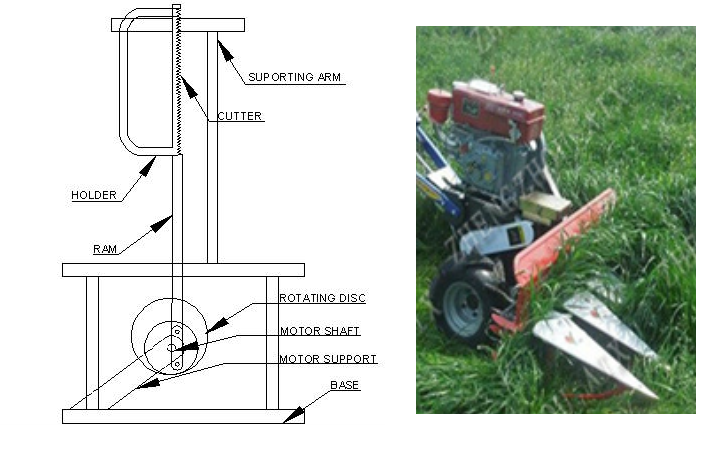 In this paper, we studied the design and fabricate small scale sugarcane harvesting machine for sugarcane harvesting to reduce farmer’s effort and to increase the output of agricultural products. When compared to manual harvesting, this machine can cut the lower and upper portion of the sugar cane containing leaves, simultaneously by setting the optimum movement of the rotary blades. Hence this project work overcomes these problems and aims to develop a small scale sugar cane harvesting machine. And this machine is easy to operate, low cost with more efficiency and have less maintenance. The machine is helpful for farmers and it is economical..
Ganesh et al, the paper entitled Low-Cost Mechanical Aid For Rice Harvesting. In this paper, we studied the machine with a modified bush cutter. A metal plate and rubber guard assembly have fitted the blade on the handle to guide the cut stalk to the left side. The machine performed well in the field conditions with a field capacity of 0.5 per day consuming 0.25 litres of fuel in an hour. This machine should be affordable to low-income farmers in developing countries..
P.B.Chavan et al, The paper is titled as Design And Development Of Manual Operated Reaper. In this, we studied about harvesting operation to the small landholders for harvesting varieties of a crop in less time and at low cost by considering different factors as power requirement, cost of equipment, ease of field condition, time of operation and climatologically conditions. The operating, adjusting and maintaining principle are made simple for effective handling by unskilled operators..
P.Amrutesh et al, The paper is titled as Solar Grass Cutter With Linear Blades By Using Scotch Yoke Mechanism. In this we studied about maintain and upkeep lawns in gardens, schools, college’s etc. they have made some changes in the existing machine to make its application easier at a reduced cost. Even Unskilled operation can operate easily and maintain the lawn very fine and uniform surface look. In our project, ―Solar grass cutter‖ is used to cut the different grasses for the different application. .
G.Maruthi Prasad Yadav et al, The paper is titled as Fabrication and Performance Test of an Ultraportable Crop Cutter. In this we studied about this Ultra portable Crop Cutter, the entire problem can be solved easily. There are some procedures involved in fabricating this device such as fabricating the prototype using suitable material and test the functioning of this machine. Among these are climate, soil, and water availability, topography, nearness to markets, transportation facilities, land costs, and general economic level. The primary agricultural products consist of crop plants for human food and animal feed and livestock products..
Hadidi et.al (1984) stated that the height of crop stubbles increasing as stalks moisture content increased and decreased with increasing of knife velocity. He added that the percentage of wheat and rice grain losses increasing as the machine forward speed increased. Increasing cutter bar speed leads to a decrease in the percentage of grain losses. Also, increasing forward speed leads to an increase in the number of uncut stalks..
Sahar (1988), reported that, the use of a large scale machine is inappropriate for the following reasons:- it needs high technical experience for operation and maintenance, high capital requirements. Low field efficiency is in smallholding and losses of straw are high on irregular furrowed soils. The use of small machines is appropriate for small holdings, low capital requirements and low technical operations and maintenance experience. El-Sahrigi et.al. (1992), developed a front mounted repair. The design features included a flat belt mechanism conveying the crop to the side of machine, improve cutter bar starwheel assembly to minimize clogging, a bevel gear drive for power transmission, a robust frame, a header provide design that will not dig in to the soil and provision to covert the flat belt conveyor drivers to chain without frame modification..
Habib et.al (2002) stated that the parameters affecting the cutting process are related to the cutting tool, machine specifications and plant materials properties. They added that the cutting energy consumed in the harvesting process..
Badr (2005) compared the performance of three different combines in terms of harvesting time, grain losses, fuel consumption, the energy required and total cost. He found that the highest field capacity of 3.02 acre/h and the lowest field efficiency of 70.5 % were obtained at a forward speed of about 4.0 km/h and grain moisture content of 22 %..
D. N. Sharma and S. Mukesh, they studied on the designing of the handle and in that study approximate 100 cm height is sufficient for pushing of any machinery. Er. Prabhakar Dutt, the Principal Scientist, studied star wheel, crop divider and conveyor design of reaper. Er. Bedse Prasad A., Er. Dalvi Devdatta N., Er. Virkar Amol D.(2013), developed manually operated reaper and evaluated performance as well as its uses and drawbacks. The design of multipurpose agriculture cutter can be extended for cutting paddy, weeds, and lawn grass etc., by using solar-powered the In present days the Concept and Technology employing this Non-conventional energy becomes very popular for all types of development activities. Finding solutions, to meet the “demand of Energy” is the great challenge for Social Scientist, Entrepreneurs, Engineers and Industrialist of our Country. According to them, the use of Non-conventional energy is the only alternate solution for conventional energy demand. There are many applications in Agriculture Sectors. Multipurpose agriculture cutter which can be used for finishing work as well as for cutting long, thick grass, brush. Its have been carefully designed for user comfort by considering ergonomics aesthetics. Particular attention has been given to avoid pollution and worker tiredness. 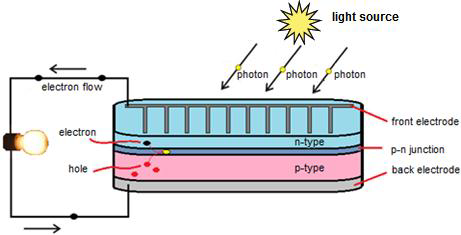 The photovoltaic effect can also occur when two photons are absorbed simultaneously in a process called effect. The photovoltaic effect is the creation of voltage or electric current in a material upon exposure to light and is a physical and chemical phenomenon., the electrons present in the valence band absorb energy and, being excited, jump to the conduction band and become free. The chemical bonds of the material are vital for the process to work, as crystallized atoms are ionized and create a chemical electric imbalance, driving the electrons. The standard and obvious photovoltaic effect is directly related to the photoelectric effect, though they are different processes. When the sunlight or any other light is incident upon a material surface These highly excited, non-thermal electrons diffuse, and some reach a junction where they are accelerated into a different material by a built-in potential (Galvani potential). This generates an electromotive force, and thus some of the light energy is converted into electric energy. Semi-conductor in which electron-hole pairs are created by the absorption of incident solar radiation. In most photo-voltaic applications the radiation is sunlight, and the devices are called solar cells. Besides the direct excitation of free electrons, a photo-voltaic effect can also arise simply due to the heating caused by absorption of the light. The heating leads to an increase in temperature, which is accompanied by temperature gradients. These thermal gradients, in turn, may generate a voltage through the See beck effect. Whether direct excitation or thermal effects dominate the photo-voltaic effect will depend on many material parameters. Sealed lead acid battery with voltage 12v and the nominal capacity of 7Amp is used for the energy storing purpose. The battery usage and maintenance is of free type. The battery is charged during the day in the presence of sun i.e, solar energy and use when necessary. The batter after charging can be used up to 5-6 hrs. Continuously. The motor used for controlling the cuter, the permanent dc motor with 12V is used having the speed 1800rpm. this single phase motor work on the Fleming hand rule and generate electric current and this electric current converted to mechanical work like to rotate the blade and cut the brush. Different types of blades are used for the operation to be done and these blades are made by cast iron, Stainless Steel, carbide steel. We are using Tungsten cutter blades for cutting purposes. The rotation of the blade gains the cutting action. It is the support to hold the equipment by the user and operate the multipurpose cutter. This is used for collecting the cut bush and putting it side. It is mounted on the blade and acts as a shield to blade as well as protect the excitation of cutting grass towards the user. The stand is used for the assembly of all the component. Stand supports used in high or low-temperature applications may contain insulation materials. 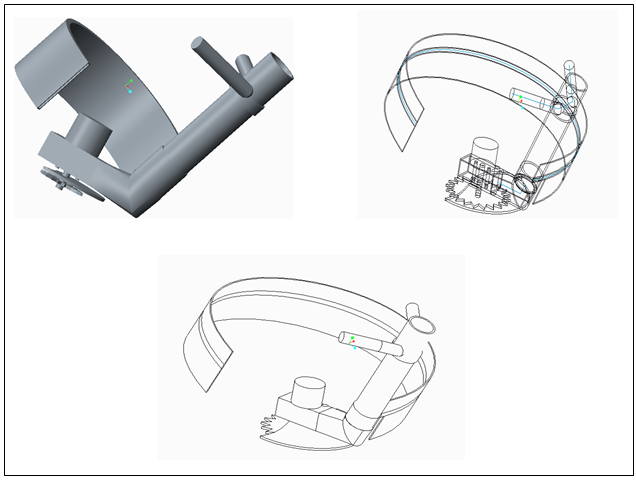 The overall design configuration of a stand support assembly is dependent on the loading and operating conditions. The weight of the Panel: 850g. Power : 16.4 x3.05 = 50 watt. Required voltage for charging the Battery: 12 volts. 200 to 300 W/ : 6 to 5 hrs. 300 to 400 W/ : 4 to 3 hrs. 400 to 600 W/ : 2 hour. Running period: 2 to 3 hours. 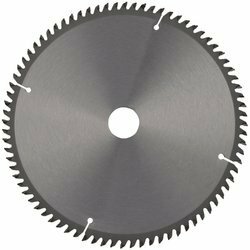 Saw blades are manufactured with high-quality tungsten carbide tips. Tungsten carbide is having extra long cutting life and sharp and smooth cutting tips which are precision ground at an optimum angle for long and smooth cutting. suitable for cutting all types of wood, plywood, veneer, particleboard, fiberboard, block board, etc. Any time metal is manipulated from one state into another, it is considered to be a metal fabrication. There are several basic categories of metal fabrication — structural, architectural, ornamental, automotive/recreational, and artistic are just a few. Metal fabrication has many facets that are not commonly known. Knowing whether the metal being fabricated contains iron (ferrous) or contains no iron (non- ferrous) is vital to a project. Welding media must be carefully chosen to correspond to the type of metal being used. A successful metal fabrication project involves intricate planning of details and can range anywhere from a basic weld to highly specialized structural metal work, rolling and bending metal, bolting pieces together mechanically, even artistic sculpture. · Shielded metal arc welding (SMAW) – also known as “stick welding”, uses an electrode that has flux, the protestant for the puddle, around it. The electrode holder holds the electrode as it slowly melts away. Slag protects the weld puddle from atmospheric contamination. · Gas tungsten arc welding (GTAW) – also known as TIG (tungsten, inert gas), uses a non-consumable tungsten electrode to produce the weld. The weld area is protected from atmospheric contamination by an inert shielding gas such as Argon or Helium. · Gas metal arc welding (GMAW) – commonly termed MIG (metal, inert gas), uses a wire feeding gun that feeds wire at an adjustable speed and sprays an argon-based shielding gas or a mix of argon and carbon dioxide (CO2) over the weld puddle to protect it from atmospheric contamination. · Flux-cored arc welding (FCAW) – almost identical to MIG welding except it uses a special tubular wire filled with flux; it can be used with or without shielding gas, depending on the filler. · Submerged arc welding (SAW) – uses an automatically fed consumable electrode and a blanket of granular fusible flux. 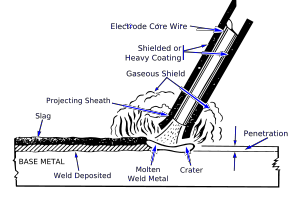 The molten weld and the arc zone are protected from atmospheric contamination by being “submerged” under the flux blanket. thicker materials between 1 inch (25 mm) and 12 inches (300 mm) in a vertical or close to vertical position. Many different energy sources can be used for welding, including a gas flame, an electric arc, a laser, an electron beam, friction, and ultrasound. While often an industrial process, welding may be performed in many different environments, including in open air, underwater, and in outer space. Welding is a potentially hazardous undertaking and precautions are required to avoid burns, electric shock, vision damage, inhalation of poisonous gases and fumes, and exposure to intense ultraviolet radiation. Until the end of the 19th century, the only welding process was forge welding, which blacksmiths had used for centuries to join iron and steel by heating and hammering. Arc welding and oxyfuel welding were among the first processes to develop late in the century, and electric resistance welding followed soon after. Welding technology advanced quickly during the early 20th century as World War I and World War II drove the demand for reliable and inexpensive joining methods. Following the wars, several modern welding techniques were developed, including manual methods like SMAW, now one of the most popular welding methods, as well as semi-automatic and automatic processes such as GMAW, SAW, FCAW and ESW. Developments continued with the invention of laser beam welding, electron beam welding, magnetic pulse welding (MPW), and friction stir welding in the latter half of the century. Today, science continues to advance. Robot welding is commonplace in industrial settings, and researchers continue to develop new welding methods and gain a greater understanding of weld quality. Shielded metal arc welding (SMAW), also known as manual metal arc welding (MMA or MMAW), flux shielded arc welding or informally as stick welding, is a manual arc welding process that uses a consumable electrode coated in flux to lay the weld. An electric current, in the form of either alternating current or direct current from a welding power supply, is used to form an electric arc between the electrode and the metals to be joined. As the weld is laid, the flux coating of the electrode disintegrates, giving off vapours that serve as a shielding gas and providing a layer of slag, both of which protect the weld area from atmospheric contamination. To strike the electric arc, the electrode is brought into contact with the workpiece by a very light touch with the electrode to the base metal then is pulled back slightly. This initiates the arc and thus the melting of the workpiece and the consumable electrode, and causes droplets of the electrode to be passed from the electrode to the weld pool. As the electrode melts, the flux covering disintegrates, giving off shielding gases that protect the weld area from oxygen and other atmospheric gases. In addition, the flux provides molten slag which covers the filler metal as it travels from the electrode to the weld pool. Once part of the weld pool, the slag floats to the surface and protects the weld from contamination as it solidifies. Once hardened, it must be chipped away to reveal the finished weld. As welding progresses and the electrode melts, the welder must periodically stop welding to remove the remaining electrode stub and insert a new electrode into the electrode holder. This activity, combined with chipping away the slag, reduces the amount of time that the welder can spend laying the weld, making SMAW one of the least efficient welding processes. In general, the operator factor, or the percentage of the operator’s time spent laying weld, is approximately 25%. The actual welding technique utilized depends on the electrode, the composition of the workpiece, and the position of the joint being welded. The choice of electrode and welding position also determine the welding speed. Flat welds require the least operator skill and can be done with electrodes that melt quickly but solidify slowly. This permits higher welding speeds. Sloped, vertical or upside-down welding requires more operator skill and often necessitates the use of an electrode that solidifies quickly to prevent the molten metal from flowing out of the weld pool. However, this generally means that the electrode melts less quickly, thus increasing the time required to lay the weld. Shielded metal arc welding is one of the world’s most popular welding processes, accounting for over half of all welding in some countries. Because of its versatility and simplicity, it is particularly dominant in the maintenance and repair industry and is heavily used in the construction of steel structures and in industrial fabrication. In recent years its use has declined as flux-cored arc welding has expanded in the construction industry and gas metal arc welding has become more popular in industrial environments. However, because of the low equipment cost and wide applicability, the process will likely remain popular, especially among amateurs and small businesses where specialized welding processes are uneconomical and unnecessary. SMAW is often used to weld carbon steel, low and high alloy steel, stainless steel, cast iron, and ductile iron. While less popular for nonferrous materials, it can be used on nickel and copper and their alloys and, in rare cases, on aluminium. The thickness of the material being welded is bounded on the low end primarily by the skill of the welder, but rarely does it drop below 1.5 mm (0.06 in). No upper bound exists: with proper joint preparation and use of multiple passes, materials of virtually unlimited thicknesses can be joined. Furthermore, depending on the electrode used and the skill of the welder, SMAW can be used in any position. 5-meter long welding cabal with electrode holder. 5-meter long welding cable with earthling clamp. Combines excellent welding characteristics with high reliability. Stepless, smooth and infinitely variable current by latest moving core design. Compact size and robust construction. Easily movable from place to place. We used this machine to make a hole to mount a motor and cutting blade. First, we created a small hole as making its centre and then we enlarged slowly it by using small rods as exact to the motor in order to tight fit. Rubber washers are used to fix the cutting blade which is to be mounted on a motor shaft tightly and to arrest the deflection. Screws are used to fix the solar panel, handle to the rod and motor spindle into cutting blade. Nut and bolt are used to fix the motor on to the supporting rod. The operation of solar operated multipurpose agriculture cutter is such that, it has panels mounted with some inclination in such a way that it can receive solar radiation with high intensity from the sun. These solar panels used to convert solar energy into electrical energy by the photovoltaic principle. After the conversion of solar energy in the electrical charge. These charges are used to store in the battery which is used for the energy storage purpose. The motor is connected to the batteries through connecting wires. There is an on-off switch button is used to starts and stops of the motor. From this motor, the power transmits to tungsten carbide cutter blade and this makes the blade to cut. In this way by providing solar energy and using photovoltaic effect the power is produced to cut the paddy, weeds, grass. The working of such type of cutter is so simple and eco-friendly. It is the power delivered from the motor. Operating System of Solar Panel: Charging can be done using a solar panel. The battery can be charged continuously during discharge itself, by attaching the panel on the equipment. 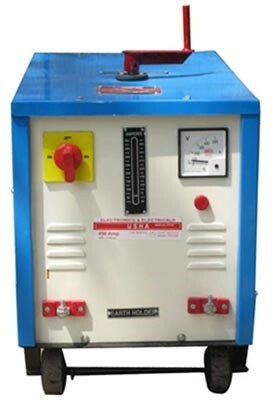 Without panel on the equipment, discharge can be done for a minimum period of 2 to 3 hours. By changing the battery, discharge can be continued for further more hours. Charging can be done by separate Solar panel attachment. Note: During Rainy, Season charging can be done by electrical devices. Economic Analysis: The cost of fuel increases day by day. It should be reduced by the modified model which works on the principle of solar energy. The operating cost of the engine cutter for one-hour operation is calculated and its value is compared with the operating cost of the solar-powered cutter. It seems that there is no need of operating cost but, the initial investment towards the charging unit is a one-time investment with a life period of Twenty years which is almost equal to the unit cost of the engine with a twist of petrol/diesel. By using the cutter blade with high strength and the increase in power used, the cutter can be used for many applications in agriculture sector like tree cutting, shrubs cutting, cane cutting, maize cutting etc. To avoid the limitation like cloudy and dark environment, the solar charger can be used. The adjustment for the folding of the stand can be done for transportation point of view. This multipurpose agriculture cutter is the replacement of the petrol/diesel engine cutter present in the market. The solar-powered agriculture cutter is the implement in a petrol engine. This cutter is totally Eco-friendly and is so useful to the people for multipurpose also. The cost of the system is reduced because of the use of solar energy in the replacement of conventional fuel energy. This cutter is more suitable to the people for the cutting purpose because of is easier handling. The common man can also offer this because of its advantage like less cost, pollution free, easy to operate, time-saving and no waste. But compared to all parts of cutter assembly solar panel is costlier and at present in order to curtail global warming and ozone depletion, the government of India offering a subsidy for solar equipment to avoid such effect on the environment, so in present days it is expected to operate of by using solar energy. The panel use for this is not much costly, it can save more fuel and the money which is for the fuel purchase. The maintenance and operating cost also reduce in this way the solar-powered multipurpose agriculture cutter is completed successfully within the working days of the project. Bainer R, Kepner RA, Berger EL (1978) Principles of farm machinery, 3 rd edn. Willey, New York. Bautista E, Regalado JS, Juliano A, Ishihara S, Monobe H, Ramos J, Molinawe L (2005) The PhilRice-JICA rotary rice reaper: redesigning a technology for Filipino farmers and manufacturers. Rice is life: scientific perspectives for the 21st century 7: 229-232. Chakraverty A, Mujumdar AS, VijayaRaghavan GS, Ramaswamy HS (2003) Handbook of post-harvest technology cereals, Fruits, Vegetables, Tea and Spices. Marcel Dekker Inc, p 883. Chancellor WJ (1988) Cutting of biological materials. Handbook of Engineering in Agriculture, Vol 1. CRC prero INC, p 35. Chancellor, W.J. (1958). The energy requirement for cutting forage. Agricultural Engineering.30(10):633-636. Prasad, J. and C.P. Gupta (1975). Mechanical properties of maize stalk as related stalk in relation to harvesting.Journal of Agril. Engg. Research. (20):79-87. Ster M.M. 2006. Wood Cutting Theory.India,Press. 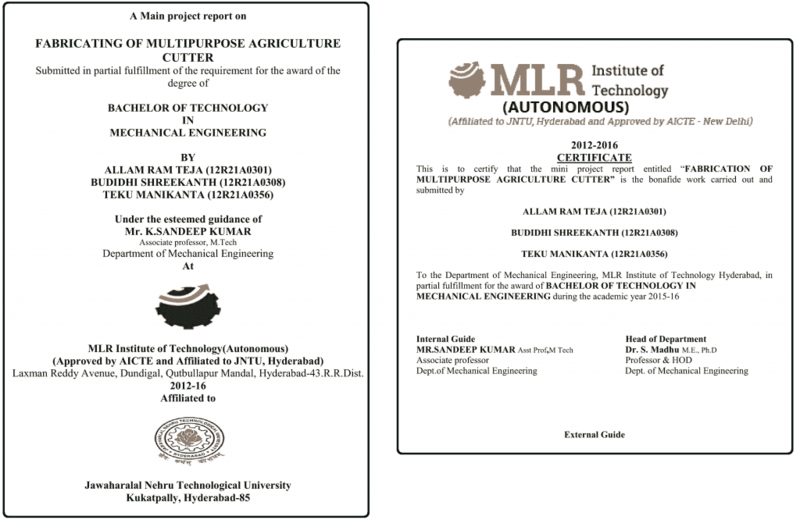 Hemant Ingale, N.N.Kasat, “Automated Solar Based Agriculture Pumping” International Journal of Advanced Research in Computer Science and Software Engineering 2 (11), November- 2012, pp. 407-410. Balfour, Edward (1885). The Cyclopaedia of India and of Eastern and Southern Asia (3 ed.). London: Bernard Quaritch. p.331. CIAE 2008. Central Institute of Agriculture Engineering& Research, Library, Bhopal. Jain R.K. 2008.Production Technology, Khanna publishers.